The Upper Columbia Basin Environmental Collaborative (UCBEC) is a collaboration of a cross-section of environmental voices from the Upper Columbia Basin representing provincial, regional and local environmental groups. In 1942 the Grand Coulee Dam was completed by the United States, entirely blocking the migration of salmon up the Columbia River into Canada. Earlier construction of the Bonneville Dam downstream in 1937 had already partially obstructed migration of sturgeon, although fish ladders on that dam allow migration of salmon and steelhead. The signing of the Columbia River Treaty in 1964 initiated a flurry of dam-building on the Columbia in Canada and the US. In Canada, the Hugh Keenleyside dam was completed in 1968, the Mica Dam in 1973 and the Revelstoke Dam in 1984. The Kootenay River system also received attention with the completion of the Duncan Dam in 1967, the Libby Dam in 1972 and the Kootenay Canal Project in 1976. The Columbia River Treaty has provisions related to flood control water storage and sharing downstream benefits between Canada and the US for storage provided by dams in Canada. In the year 2024, the pre-paid flood requirement for flood storage provided by Canada will change to “called upon” flood storage. In addition the Treaty states that any time after September 16, 2024 either the US or Canada can withdraw from the Treaty with a minimum of 10 years advance notice. In addition the US and Canada have signed Non-Treaty Storage Agreements to govern how additional storage available in Canada will be managed. Due to impending changes in the Treaty in 2024, and the recognized need to modernize various aspects of the Treaty, the US and Canada have entered into formal ongoing negotiations regarding potential Treaty changes in the spring of 2018. UCBEC views these ongoing negotiations as an opportunity to introduce concepts of improved ecosystem function and restoration into the Treaty. It is an opportunity to widen the Treaty beyond flood control and hydro-electric power to include considerations for improving damaged aquatic, wetland, riparian and associated terrestrial ecosystems. The primary focus of the Upper Columbia Basin Environmental Collaborative is to improve the function of Canadian ecosystems impacted by dams and reservoirs in the Columbia Basin, including those in the terrestrial, aquatic and riparian/wetland realms. 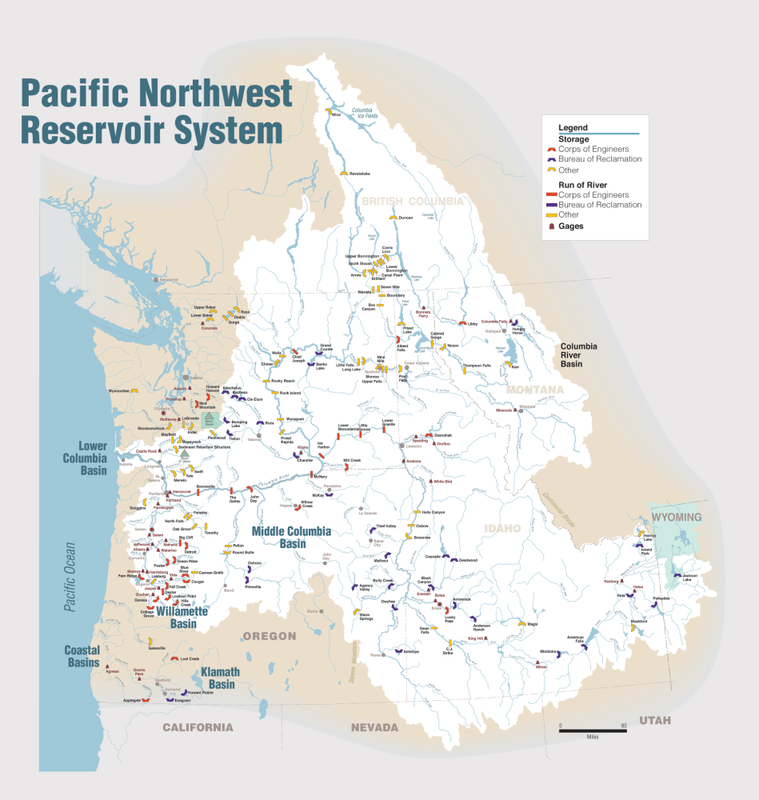 Although our emphasis is on Canadian reservoirs and river reaches, we also promote ecosystem restoration in the USA, to ensure maximum ecosystem function is maintained and improved throughout the Columbia Basin as a whole. We would like to see ecosystem restoration, creation and/or enhancement occur within, or in proximity to, all the Canadian reservoirs to the extent possible. However, we do recognize the need to balance restoration/enhancement efforts among reservoirs to achieve the greatest net ecological benefits. Salmon reintroduction is a potential component of improved ecosystem function to the extent that it is consistent with our primary focus. The successful spawning of salmon in the upper Columbia Basin is, in part, dependent on the achievement of our primary focus. We work to achieve our objectives through technical contributions; public engagement and outreach; participation in related initiatives, and constructive dialogue with government, non-government interests/groups and First Nations. UCBEC is presently developing a discussion paper to explore options for revising dam operations to improve environmental values in Canada’s Columbia Basin. The scope of the discussion paper includes reservoirs and reaches of the Columbia, Kootenay and Pend-d’Oreille Rivers affected by hydroelectric dams. The options focus on improving terrestrial and aquatic ecosystems within Canadian reservoir footprints and large riverine habitats along the river reaches downstream of the impoundments. A draft of the full discussion paper and a 2-page summary of the draft paper can be downloaded below. Our presentation to the Canadian and US Columbia River Treaty negotiators at the Pacific Northwest Economic Region Columbia River Summit in Spokane WA on July 25, 2018 is available below. See also the link further below for videos of our presentation and others at the conference. This web link leads to a report commissioned by BC Hydro Fish and Wildlife Compensation - Columbia Region that summarizes the environmental impacts of the various BC Hydro reservoirs on the Kootenay and Columbia River systems in Canada. The Mid Arrow link provides access to a report commisioned by the BC Ministry of Energy and Mines and BC Hydro to explore alternative scenarios for managing the Arrow Reservoir. The report summarizes potential environmental benefits that may result from scenarios that reduce the annual variability in the level of the reservoir. Mid-Arrow Scenario 3 links to a short report looking at a further scenario that attempts to increase the benefits, while further minimizing costs, based on the learnings from the main report. The Columbia River Symposium was held at the University of Victoria in May of 2018. The website includes a written summary of the symposium presentations as well as videos of the presentations themselves. At about 55 minutes in Session 2 – there is a presentation of the environmental impacts of the dams in BC and a description of one option for improving ecosystem function in the Arrow Reservoir. Various other presentations discuss topics such as governance, climate change and salmon restoration. The Pacific Northwest Economic Regional Summit on the Columbia River Treatywas held in July in Spokane, Washington (7/25/18). The summit provided an opportunity to hear the US and Canadian negotiators present their comments on the negotiations at that time. Following their presentations, a number of invited speakers provided comments on the negotiations from various perspectives, including Federal, State, Provincial, County and Municipal politicians, First Nations and Tribes, and other interested stakeholders and entities. The above link connects to a video of all the presenters at the summit - beginning with presentations by the Canadian and US negotiators. The following list highlights some speakers relevant to the issues raised by UCBEC: at about 35 minutes Deb Kozak representing the Local governments Committee in BC; 38 minutes Kathy Eichenberger representing the BC Min. of Energy and Mines; 53 minutes presentations by DR Michel for the Upper Columbia United Tribes (UCUT); 57 minutes John Osborn for the Ethics and Treaty Project, Columbia River Roundtable and the US Sierra Club; at 1 hour Kindy Gosal for Columbia Basin Trust; at 1 hour 4 minutes, Greg Utzig for UCBEC and 1 hour 52 minutes, Katrine Conroy, representing the BC Government; followed by Canadian MPs Wayne Stetski and Richard Cannings. Other speakers, mainly from the PNW region of the US, are interspersed throughout.